As one of the leading executive search firms advising on public appointments for over 30 years, Saxton Bampfylde has developed a strong interest in how people who have developed their careers outside of government find the process of being appointed to, and then the experience of holding, non-executive roles in the public sector. This year we have spoken to a number of first-time public appointment-holders about their experiences to establish an understanding of what draws senior individuals, particularly those with little or no prior experience of government, to take on non-executive roles with public sector organisations and the challenges they face in adapting a new culture. 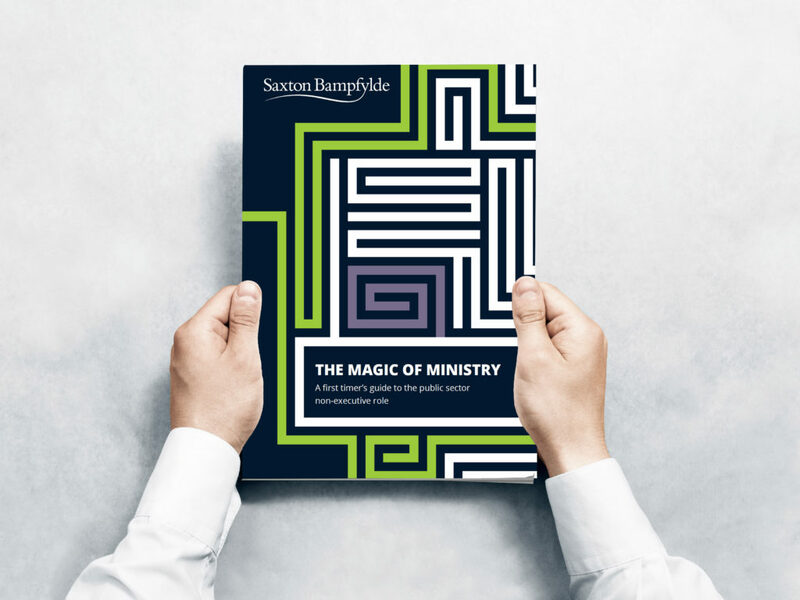 To summarise these discussions and the themes arising from them, this Autumn Saxton Bampfylde has published ‘The Magic of Ministry: A first timer’s guide to the public sector non-executive role’. 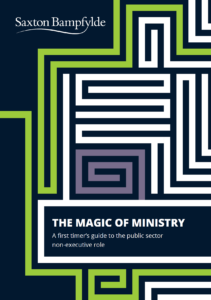 This research is intended to inform and advise those considering a similar move so that they can enter into the process with their eyes open and be fully aware of the huge benefits a public sector role can give. We also hope it will give those responsible for recruiting first-time non-executives an insight into the ways in which this transition can be managed to ensure that the sector has a strong pipeline of the most talented, innovative and strategic leaders going forward. We hope that you will find this piece thought-provoking. We have thoroughly enjoyed our research in this area and conversations with our contributors and would warmly welcome any feedback on the experience of stepping into the non-executive world for the first time.